I guess I take after my mom in that I have a strange attraction to boxes. I even hoard them if they are sturdy or unique looking. This drawer was once a Book Box for lack of a better definition; some large hardbound books used to have a cover like box that they slid into, this one happened to be a 1956 animal encyclopedia for children. 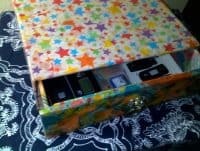 I donated the book to an elementary school library but couldn’t turn loose of the rugged red cover box. In my collection I had another sturdy box that fit perfectly-loosely inside with the opening on the top, and the drawer was begging to be made! A note, I save a great many items besides boxes that get me funny looks, wrapping paper, tissue paper, packing paper that comes inside new shoes, oh yeah, I’m a hoot at holidays and such where gifts are exchanged. Even fast food napkins! They all have a different texture, absorbency, strength, opacity, and workability to them. Maybe because I also make handmade paper Ive come to appreciate the varieties of medium the “paper” in Paper Mache can be. O.k. so I started out with these 2 boxes and the first thing I do when working with cardboard is to protect it from the warping and sagging that happens if you just start throwing strips of liquid soaked paper on there. I like to use a homemade Gesso type of stuff I make out of Sheetrock Mud, Elmers Wood glue, and some acrylic or latex paint. I use the wood glue instead of the Glue-All because once it dries it is very water resitant. Sorry I don’t have amounts for you… I just mix it till it feels right. First paint on a layer vertical, then horizontal on each side, inside and out, it dries so quickly (with a ceiling fan on low in my workspace) that you can keep going up to the 4 layers I normally do without stopping and waiting. Then i gently sand off any lumps or uneven places with Drywall Sandpaper. At this point I realized I would need a drawer front to keep the drawer from sliding to far inside. I cut a piece of 1/8″ hardboard large enough to cover the front of the larger outside box without hanging over and glued it to the front of the inside box. My first layer of paper was grayish white packing paper like you would find stuffed in something new… it works great to cover any printing on the boxes and give a uniform color, it is wrinkly but smoothed out super over all the surfaces. Next I used my favorite, colored, patterned, recycled, tissue paper in about 3 layers and a fun pattern. Topped it all with a varnish I cant recall (sorry) something that was for outdoor use I believe. The Lion Head Pull was just something I had been saving 15 or more years, I just thought it was so cool and finally something I could use it on! Drilled a hole in the front of the drawer, screwed it on and Viola! I use it on top of the computer desk hutch to throw the little junk that everyone (my 3 teenagers) leaves laying here, like Ipods, and Flash Drives, and SD Cards. Hi, Thanks so much for the tutorial. 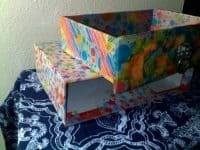 I’m interested in making some paper mache drawers and shelves from cardboard boxes too. Has anyone tried to seal the base cardboard box with brown packing tape or transparent scotch tape? I am new to paper mache and I don’t know much about all kinds of glues or materials mentioned in most of the posts 🙁 Also, I’m trying to go with what I already have on hand, like scotch tape and latex glue. Thanks again! I too have an affliction to boxes and although I had not thought to do what you did, I can tell you now that I will. And thanks. One thing I did do with boxes, though, was to take the baby wipes boxes from buying them by the case and after securing the flaps in the inside, I painted them a semi-gloss white and then hung them on my grandaughter’s wall and she uses them for her Polly Pockets. Each one was mounted just at her eye level with the only decoration being pastel-colored material on the back “wall”. I was tryly surprised at how sturdy those boxes are and how well this turned out. Thank you for your contribution and if you don’t mind, I’d like to play copy-cat. 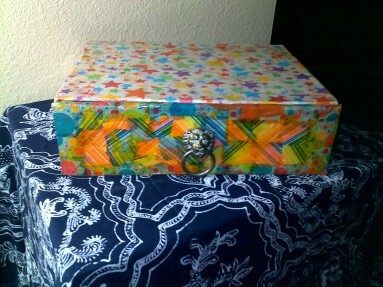 hey i wanted to make some drawers for my closet out of paper mache to organize my makeup and stuff in. i was wondering about how thick did yours come out because i would like mine to be about 1/4 of an inch thick. i would like it to be sturdy and long lasting. should i use cardboard or hardboard or nothing? i was also wondering if you could recommend some kind of gesso i could use to cover the cardboard that didn’t use sheetrock mud. Really lovely and useful idea Tani- we have just moved house (and country) and we need somewhere to store footwear in our open-plan space, so I am inspired by your drawer and shelf ideas. Thank you!